All-rounder Lewis Gregory wants the chance to prove himself with the bat at Somerset after impressing with the ball so far this season. The 21-year-old has taken 18 wickets in the first three Championship games of the campaign, including a career-best 9-97 against Sussex. And he has also contributed with the bat, scoring 128 runs at an average of 42.66. 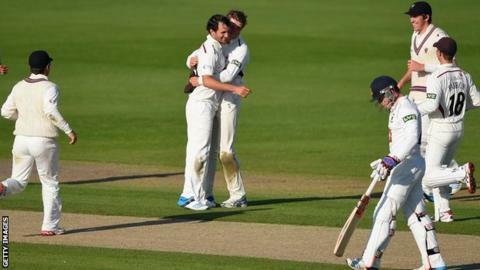 But Gregory told BBC Somerset: "I see myself as a batter who bowls." He continued: "However, with the amount of talent we've got with the bat, I'm likely to get in the team as a bowler. "The only thing I can do is take some wickets and when I get an opportunity with the bat I need to contribute to the team performance." Gregory has been at Taunton since 2010 but was primarily used as a one-day player until last season. In 2013, he played six first-class matches, taking 14 wickets at 25.57, including a previous career-best 5-38 against Middlesex at Lord's. And Gregory feels like he has made strides in the past year. "This season and the end of last season was a big stepping stone for me, to get that consistency within my game and within the team," he added. "All I can keep doing is keep trying to go out there and perform and hopefully it will stay that way."